In a couple of days I will publish the review for Khaospath’s …For The Devil Speaks The Truth, their latest record, released via Belgium’s Immortal Frost Productions (don’t miss it! ), but first I’ll focus on the former full length by these Swedes (actually, the origins lie in Malta). I know that this is an ‘older’ recording in mean time, but then again: it is never, and I repeat: NEVER, too late to give some additional promotion and attention to great material! Hellcommander Vargblod, the driving force behind Khaospath (you might surely know that name from Draugûl too), wrote on this debut over a period of more than a year, and it was recorded (+ mixed & mastered) at the main member’s Minas Morgul home studio. The digipack does not come with an additional booklet with information (like lyrics), but at least the artwork (here too: no idea who’s behind it) is intriguing, giving more than just a modest hint of what the sonic side of this total package might stand for. Synagoga Obscura consists of seven pieces (amongst which a cover – but I will surely come back to that one in a next paragraph! ), clocking about thirty-three minutes. The album stands for a harsh, fast, militaristic and merciless form of Second Wave-inspired Black Metal, quite melodious and, at the same time, overwhelming and brutal in all aspects. 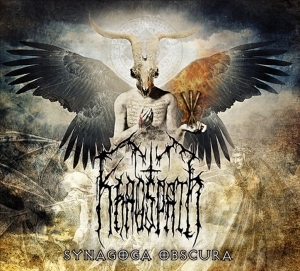 Despite many colleagues from the Mediterranean, Khaospath’s influences are not of the Norwegian kind, yet rather Swedish-inspired (as I did mention in the first paragraph – and that cannot be just a coincidence, Mark Azzopardi [which is the real name of Hellcommander Vargblod] moved over to Sweden in mean time). It’s not that I can simply refer to, well, let’s say Dark Funeral, Dissection, Setherial, Mithotyn, Nifelheim or whatever band that might come to mind right now. But it’s with certainty that this specific scene did play a very important role in the choice of Khaospath’s evolution. And you know, actually this sounds quite fine indeed. A first reason is that Khaospath is not just a cheap clone, a mindless copycat of any Swedish (Second Wave) act at all. No, I do not want to pretend that this project is renewing, or reinventing the scene. They are not, you know. Don’t expect any originality, in case you were craving for it. Yet still, somehow, there is that subtle ‘little thing’ that characterises this act, and it might be a mind-fucker, but in one way or another there is a sublime Mediterranean touch inside the execution. It’s the specific handling of some guitar riffs, I guess, but with a focused ear drum you might notice it too – or as said before, it might be some nastic play-with-your-brain. Anyway, lacking of originality, but 1) having a typifying character and 2) doing it in quite a professional manner, that might lead to superlatives. …not necessarily, but ‘it might’… Well, I think that Hellcommander Vargblod somehow succeeded to convince with this first album under the Khaospath banner. All compositions are quite overwhelming, minitiously played, and rich of highlights. Okay, those who already searched for the reviews I did for Draugûl (and I promise you that there is one more to come up next, also in a near future), have noticed my appreciation for Mark’s ability to write and play great material, but with this project he truly impresses me. So let’s skip the unnecessary crap and come to this conclusion: Synagoga Obscura is quite an impressive Swedish-influenced Black Highlight with a lot to offer: magisterial song writing + performance, subtle yet ingeniously performed solos, magic keyboard support, a monstrous supporting rhythm section, violently blasting assault interacting with semi-emotive excerpts, and much more. PS: besides an upcoming review for Khaospath, you can expect some more reviews for (new and slightly old) material from Pesttanz Klangschmiede as well in the future – stay alert!